This goes well with schnitzel or with the stroganoff. One medium size head of read cabbage, shredded. 3 tablespoons red wine vinegar, 1 tablespoon sugar, salt and pepper to taste. half a potato grated, 1/4 water. Cut bacon into small pieces and brown or just add olive oil to dutch oven on low to med. add onions and cook until soft then add cloves and cabbage and all other ingredients (except potato). Cover. Stir occasionally so as not to burn, when cabbages is wilted and potato to thicken juices. Ready to serve. Usually this is much better if made a day ahead then slowly reheated. Beef Stroganoff with a twist. This is a very old recipe. 1/2 of onion diced, sauteed with butter till onion are clear. Paprika, salt and pepper to your liking. Place in dutch oven in 325 degree oven for 2 hours. in a cup take two teaspoons corn starch and 1 teaspoon flour and make a rue. Add the rue slowly to heated dutch oven. 1 loaf of bread that has been sitting out to dry about 2 hours or overnight. 1 tablespoon butter, half an onion finely chopped and sauteed with butter till onion are clear. 2 eggs, 1 teaspoon nutmeg, 2 teaspoons salt, 1/2 teaspoon pepper, handful finely chopped parsley and 1 1/4 cups warm milk. Use your hands and blend all the ingredients if it’s too mushy added some extra bread crumbs. make into hand size dumplings and place in boiling water. Cover and simmer for 30 mins. Remove from heat and let steep for another 10 mins. 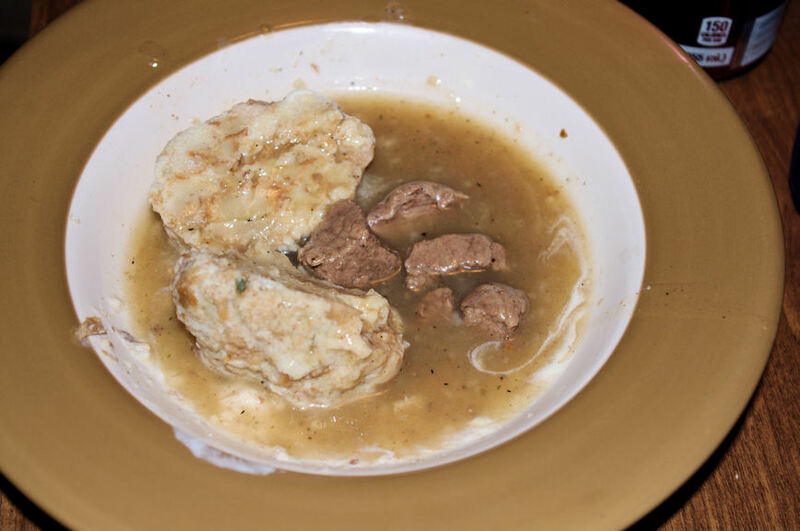 Cut up the bread dumplings in bowl and beef mixture and them put a spoon or to of sour cream on top.